The McLaren 675LT, which debuted in production form at the 2015 Geneva Motor Show, is the lightest, most powerful, fastest and most track-focused, yet road legal, model in the McLaren Super Series, and resurrects one of the most revered names in modern-day GT racing – the ‘Longtail’. It is also the most exclusive in the range, with confirmation that 500 coupés will be produced, all of which are now sold. The 675LT, the first McLaren in nearly two decades to wear the LT – or ‘Longtail’ – name, stays true to the spirit of its iconic predecessor with aerodynamically optimised, dramatically enhanced styling that results in 40 percent more downforce than the 650S which it sits alongside in the McLaren Super Series. The main focus for the 675LT is clear: to deliver maximum performance, engagement and excitement. To achieve this, weight has been reduced by 100kg through the increased usage of carbon fibre – the signature material of McLaren – and by lighter components throughout, including newly developed suspension geometry derived from the McLaren P1™, resulting in an increased track of 20mm. Power of the newly-developed M838TL 3.8-litre twin-turbocharged V8 engine is 675PS (666bhp) at 7,100rpm, with a torque figure of 700Nm (516 lb ft) at 5,500-6,500rpm. These extreme weight saving measures see the 675LT with a dry weight of just 1,230kg (2,712 lb), meaning a power-to-weight ratio of 549PS per tonne. The sprint from 0-100 km/h (0-62mph) takes 2.9 seconds, with controlled torque delivery ensuring optimised traction off the line. Acceleration continues at relentless pace with the 200 km/h (124mph) barrier broken in 7.9 seconds, on to a top speed of 330 km/h (205 mph). Despite these remarkable performance figures, the 675LT returns 24.2 mpg (11.7 l/100 km) on the EU combined cycle, and CO2 emissions remain the same as the other Super Series models, at 275g/km. New carbon fibre bodywork minimises weight and optimises aerodynamic performance, with the addition of a newly designed front splitter, Formula 1™-style nose end-plates and larger ‘Longtail’ Airbrake. The rear deck is also new. These bodywork changes contribute to a significant increase in downforce levels, up 40 percent over the already extremely aerodynamically-efficient 650S. The 675LT is fitted with adjustable settings for both Handling and Powertrain through the Active Dynamics Panel rotary switches. While a system shared with other models in the McLaren range, the Normal, Sport and Track settings are uniquely calibrated to the 675LT, and are designed to provide the most engaging and track-focused experience. The body changes, all driven by aerodynamic needs, increase the design drama. Front ride height is reduced while the track is wider. Handling is optimised through a stiffer and lighter suspension setup, which includes uprights and wishbones derived from those fitted to the McLaren P1. The adjustable suspension settings have been recalibrated, boosting driving engagement, road holding and agility. Standard-fit Ultra Lightweight 10-spoke forged alloy wheels are the lightest design ever offered by McLaren, saving a combined 800g over the lightest wheel design previously offered. 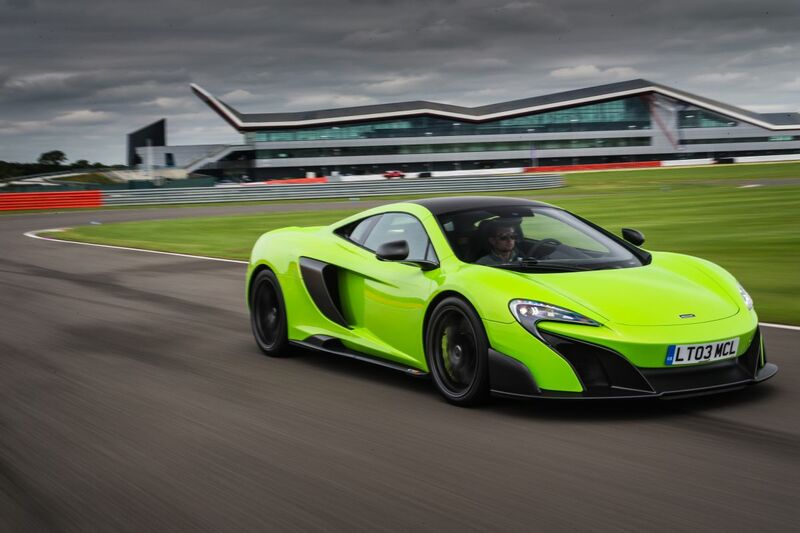 Though noticeably faster, the 675LT also retains much of the 650S’ astonishing usability and practicality. While designed to be even more at home on the track, it is still a highly usable road car with compromise to comfort levels kept to a minimum. The cabin is upholstered in lightweight Alcantara, and features a four-speaker Meridian hi-fi, DAB digital radio (Sirius satellite radio in North America) and a satellite navigation system as standard. In the pursuit of minimal weight, and to suit its purposeful intent, air conditioning has been removed, but can specified as a no cost option. The driver-focused and minimalist environment is designed to be ergonomically optimised with minimal distractions for the driver. The uncluttered driver zone is void of steering wheel-mounted switches, with clear and concise displays either side of the larger rev counter. Extended carbon fibre gearshift paddles are mounted on a rocker behind the steering wheel. Inspired by those fitted to the McLaren P1, these are produced from carbon fibre for the first time on the Super Series. A pair of lightweight carbon fibre-shelled bucket seats, upholstered in Alcantara and embossed leather are modelled on those in the McLaren P1. These reduce weight by 15kg and improve the connection between car and driver. Carpet and sound deadening materials are limited within the cabin, further reducing weight. The 675LT is offered as a coupe only, and limited to only 500 examples worldwide. Priced at £259,500, all have now been sold, with first deliveries scheduled to begin in July.